Provide flexible seating for uniquely shaped landscape areas with a Convex Downtown Plaza Bench. 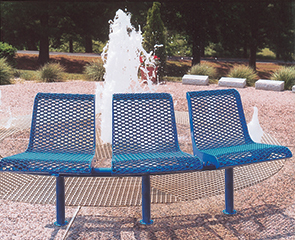 Featuring a 15° convex angle and diamond pattern steel, this steel 3 seat one-piece bench is a popular choice for variety of installation types—around trees, fountains, sidewalk bends or rounded boarders in urban spaces. Portable, surface and in-ground mount benches available. The simple tubular 2-3/8"O.D. frame is MIG welded to provide superior support and connect the 3 expanded metal seats. Protected in a resilient thermoplastic powder-coat finish, this diamond pattern Convex Downtown Plaza Bench is shielded against fading, abrasion and corrosion ready for continued exposure to seasonal conditions.